You will listen to music written according to an aesthetic of “surprise”. However, in order for there to be a “surprise”, it is necessary that the gap with the “normality” (what is expected) comes within a shared horizon of expectation. The game with the tradition – sometimes indulged, sometimes neglected – creates a dynamic which may be called my “style”, the form of my musical thought. The horizon of these pieces ought to be called “narrative”, but this CD has not a proper story; there isn’t a “program music”. Music moves within an archipelago of meaning and aims to tell a possible, potential story, a situation that arises from an extra-musical inspiration; it proposes to express the affections of the soul as directly as possible, attempting to emancipate itself from pre-established paths, codified techniques, presumed historical necessities. Inspired by the description of an Invisible City by Italo Calvino, Octavia is a city suspended over an abyss, through a network of ropes. The life of its inhabitants is driven by a desperate vitality, in the consciousness of the inevitable fall. This composition is a reflection on death. Imagine a procession with Aida and Radamès in the afterlife (ideally it is a postlude to Verdi’s opera, mentioned in the title and inside the piece itself) in which the solo trumpet plays the role of the “Celebrant” and the orchestra become the Assembly. Within this symphony is showed my relationship with the element of air: contemplative. I lived in a seaside town for a few years; there I could see the effects of Air on nature – more evident than elsewhere. The Symphony of Air is the result of the observation of atmospheric phenomena and how they effect the human soul. The Introduction is a kind of reverie, focused on the subject that observes. Nuvole in viaggio [Travelling Clouds] is the first description of an event, a shot of the changing sky. Borèa is again a “subjective”, a reminiscence of the myth of the girl seduced and abducted by the wind. Tùrbine is again the description of an object: the storm (more joyful than tragic). This piece is inspired by those rudimentary video games that appeared in Italy when I was a child. They were with sharp colours, very bright, and the unmistakable and obsessive sound: the “square wave”. The gamer was able to overcome the increasing difficulties with a skill acquired over time (experience), and an ability to improvise always renewed. This is what I ask to the soloist virtuoso, a performer/gamer of this piece/video game that also includes improvised parts. The last composition is completely different. Written about fifteen years before the others. There is no extra-musical inspiration, and the narrative focuses mainly on the formal development of the piece. I breathed the score with mournfulness, almost a regret for a lost world I have not had the opportunity to meet directly. David Whitwell is a trombonist from New York City. He is active as a soloist and improvisor, having performed concerti and solo recitals and recorded albums across Europe, the US, and Scandinavia with groups such as The Budapest Symphony Orchestra, Orchestra I Pomeriggi Musicali, the Dedalo Ensemble, the Etymos Ensemble, and the Manhattan School of Music Philharmonia. He has been principal trombonist/member of numerous orchestras and ensembles, including the Britten Pears Contemporary Ensemble (UK), the Orchestra Now, the So Wrong it's Right trombone quartet, the German free improv group Xenophobia Quartet, and he is also the creative director of the Eco Music Big Band. He is a graduate of Manhattan School of Music, Brooklyn College Conservatory, performed his Carnegie Hall solo debut in 2017, and was named a Britten Pears Young Artist. Enrico Carraro was born in Italy in 1985. Since January 2013, Enrico is Principal Viola of the orchestra of Teatro Regio of Torino and of the Filarmonica Teatro Regio Torino where he’s also a board member. He had performances in some of the world’s most important concert halls (Carnegie Hall, Bunka KaiKan, Marinskji Theatre). He has been Principal Viola of the chamber orchestra “I Pomeriggi Musicali di Milano” since 2010 and he collaborated with “Orchestra del Teatro la Fenice di Venezia”, “I Solisti di Pavia”. Enrico has given many chamber performances in collaboration with Mario Brunello, Enrico Dindo, Ilya Grubert, Sonig Tchakerian and Piero Toso. He studied with Sonig Tchakerian, Ilya Grubert, Davide Zaltron, Simone Briatore, Alfredo Zamarra, “Trio di Parma”, “Quartetto di Cremona”, “Trio Italiano” and at “Orchestra Mozart's Academy”. Marcello Bufalini has been a guest of Orchestre de la Suisse Romande, Radio-Symphonieorchester Wien, Wiener Tonkünstlerorchester, Münchner Rundfunkorchester, Mozarteum Orchester Salzburg, G. Enescu Philharmonic, Bucharest, Orchestra del Teatro La Fenice di Venezia, Orchestra Sinfonica "G. Verdi", Milano, Orchestra dell’Arena di Verona, Orchestra della Toscana. After his operatic debut at the Wiener Kammeroper, he has been a guest of the Slovak National Theater, Opéra du Rhin, and of many opera houses in Italy. In 2006 Marcello Bufalini completed the Piano Concerto in e minor by Felix Mendelssohn, which has already been performed in Europe, USA, Canada, South America and in Japan, and was recorded by Riccardo Chailly and the Gewandhaus Orchester. Marcello Bufalini is Conducting Professor at the Conservatorio of L'Aquila, Italy. Marco Pierobon has performed as a soloist with the Maggio Musicale Fiorentino, the English Chamber Orchestra, the Vienna Kammerkonzert, I virtuosi del Teatro alla Scala, and with the Symphony Orchestras of Mantua, Bolzano, Vicenza, and Sanremo. He won first prize in the international competitions of Passau, Germany and Imperia and Aqui Terme, Italy. From 1999 to 2002 he was principal trumpet of the Maggio Musicale Fiorentino Orchestra, and from 2003 to 2008 he was principal trumpet of the Accademia di Santa Cecilia Orchestra. He has collaborated as principal trumpet with the Chicago Symphony Orchestra and the Filarmonica della Scala Orchestra. Pierobon has worked with conductors Zubin Mehta, Isaac Karabtchevsky, and Ralph Gothoni. In 2017 he conducted the Croatian National Theatre Orchestra Zagreb and the Orchestra da camera di Perugia. 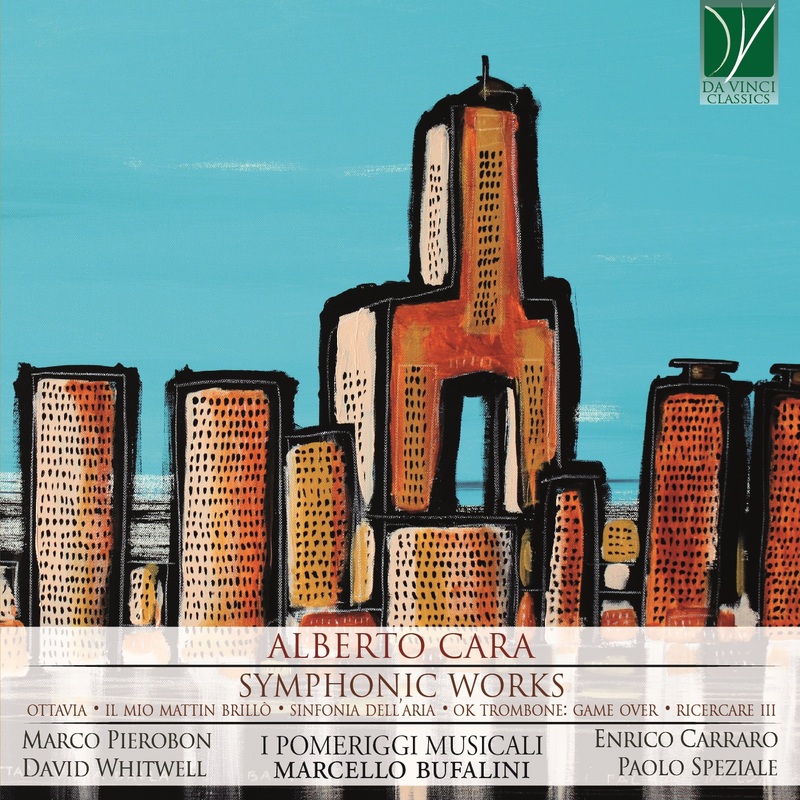 Alberto Cara, composer Born in Tivoli in 1975, currently resides in Milan. After completing his Secondary School, he completes his musical training at the Conservatory with a diploma in Piano and Composition. He is also graduated in Literature. He composes symphonic, chamber and operatic works. In 2007 he composed Il colore di Cenerentola, fiaba metropolitana in Quattro scene. The opera was premiered during the 2007 – 2008 seasons at the Piccolo Regio Laboratorio (Teatro Regio - Torino) and L'Altrocomunale (Teatro Comunale - Bologna). His chamber and symphonic works have been performed both throughout Italy and internationally in various seasons. In 2015, along with the director and librettist Stefano Simone Pintor he founded The Social Opera House, which is the first fully virtual opera theatre. At the same time, he composed the music of the pilot episode of The Banker, the first Web-Opera-Series ever conceived.